James Martin's homemade version of this retro classic is well worth the effort, but feel free to cheat with a good quality shop-bought jam. For the sponge, beat the ice cream until softened then spoon into a 5cmx30cm/2inx12in long clean plastic or metal pipe. Place into the freezer and freeze for 3-4 hours, or until solid. Alternatively, soften slightly and place onto a sheet of baking parchment, then roll up and mould into a sausage 5cmx30cm/2inx12in long and freeze until solid. Preheat the oven to 190C/375F/Gas 5 and line a 23cmx33cm/9inx13in Swiss roll tin with baking parchment. Place the eggs and sugar into a bowl and whisk until very light, fluffy and thickened. Sift the flour over the mixture and fold in carefully. Pour into the lined tin and smooth with a spatula until evenly spread out. Bake the sponge for 10-12 minutes, or until just firm to the touch. Place a sheet of baking parchment that is slightly bigger than the tray onto the work surface and dust with some caster sugar. Turn the sponge out onto the parchment paper, then peel off the parchment on the bottom of the sponge. Set aside to cool slightly. For the strawberry jam, heat a frying pan until hot, then add the sugar, lemon zest and juice and cook for 3-4 minutes until the sugar has dissolved and slightly thickened. Meanwhile place the strawberries into a food processor and pulse until very roughly chopped. Add to the pan, mix well and cook the jam for a further 3-5 minutes until thick. Remove from the heat and set aside to cool. 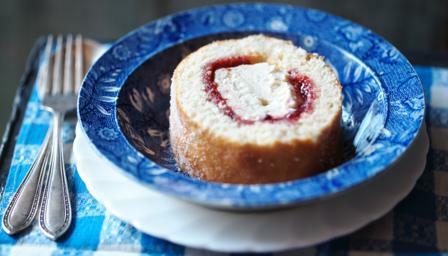 To assemble the roll, spread the strawberry jam over the cooled sponge, leaving a 2cm/1in gap around the edge. If the pipe used to set the ice cream is metal, run a blow torch over the pipe to release the ice cream or if plastic, dip in hot water to release the ice cream from the pipe. Place the ice cream cylinder along the long side of the sponge, then using the parchment paper underneath, roll up the sponge so the ice cream is encased in sponge. Roll the sponge off the parchment and cut into slices to serve.